I know some women reminisce back to when they were little girls and would dress up their Barbie dolls in white and think about how beautiful their wedding will be one day. That wasn’t really me, or at least I can’t remember a single wedding planning thought from my childhood. However, I am a planner. I like spreadsheets, organization, and details. So planning a wedding was right up my alley. We got engaged June 18, 2012 and our wedding was June 22, 2014. Yes, you read those dates correct…. we were engaged for 2 years and 4 days! Clearly we had lots of time to plan and I think my wedding theme changed about 4 times throughout that time. Once we actually had to start booking things and committing to ideas, I was already sure of what the plan would be. I loved my wedding. It was exactly what I wanted it to be. That being said, there are a few things that I may have done a little differently and a few things I would have absolutely done the exact same way! I got my hair and makeup done and I was so happy I did. My sister (and Bridesmaid) is a hair stylist and I thought about having her do my hair at first to save some money. Once I started thinking about it more I realized it would be better to let her enjoy the morning and not have her stress about getting me ready. The hair stylist at the salon was great, but we had some trouble really nailing what I wanted, so I actually had two hair trials. It was so worth it and once the wedding day arrived I was so totally calm because I knew it would be perfect. If you don’t care about riding in a fancy limo but you really want a pair of Louis Vuitton heels then do it! Don’t feel obligated to incorporate things because that it what everyone else is doing. It is your wedding and should reflect you! When I did my wedding schedule I made sure to include lots of time for photos. We did a First Look before the ceremony and it was the best decision we made. 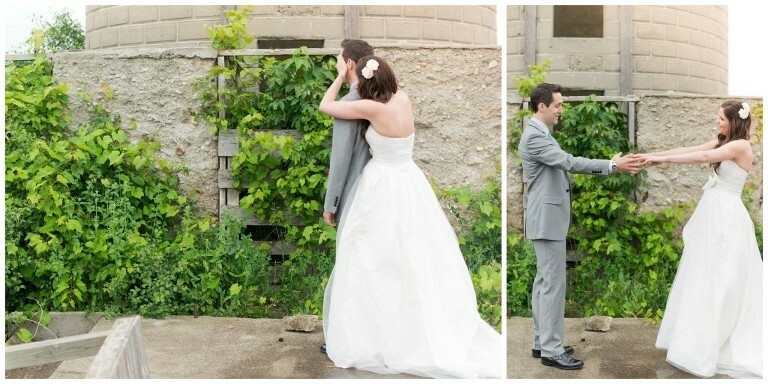 We loved having a little time that day just to ourselves and the resulting photos were some of my favorite! You can’t worry about all the day-of details and actually enjoy yourself. My budget didn’t have room for a wedding planner (although I would highly recommend getting one if yours does – or at least a day-of coordinator). I made a list of assignments for people in our wedding party that included: bring the umbrellas to the venue, take the programs to the church, put my bags in the wedding night suite, bring my veil to put on for the ceremony, etc. Heck, someone was even responsible for making sure I ate. I literally had nothing to worry about on the day because everyone had one or two things they had to do and I never gave it a thought. If you are not fussing over little things, then you are able to really experience and enjoy your wedding day. Thank you to my lovely wedding photographer, Laura Kelly, for capturing all these photos of my big day.